Students demonstrate against the death of Jesus Ramirez along one of the main avenues in Caracas, Venezuela, on Wednesday. (CNN) -- Mourners in the western Venezuelan state of Tachira on Wednesday laid to rest the body of a university student who was shot dead while participating in a student protest. "What there is no doubt about is that the police of Tachira state and under the authority of the irresponsible governor of that state used improper procedures that resulted in the unfortunate casualty of one dead student," El Aissami said in statement. 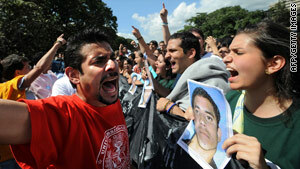 A Tachira police spokesman vigorously defended the department. The national government is "saying that we were responsible, which is completely false," spokesman Ignacio Bolivar said. "Those are baseless statements." According to the National Experimental University of Tachira (UNET), students were protesting a reduction in the school's budget, failures in infrastructure that was affecting electricity and other public services. Tuesday's protest was also a response to an incident last week at another local university, where student protesters were shot at, injuring one. Students from a nearby state-funded university faced off with the UNET students, and over the course of several hours the protest degenerated into a shouting match and rocks and other projectiles were thrown, Bolivar said. Nonstudent supporters of Chavez also joined the counterprotest, and one of these men is suspected of the shooting into the crowd of protesters, Bolivar said. Ramirez, a first-year mechanical engineering student, died en route to the hospital.